Are you looking for a unique "Dubai" experience to try? Or maybe a special "day-out-with-dad" activity? Why not have a go at deep sea fishing on our beautiful Arabian Sea? On land, the weather is getting hotter by the day but the temperature at sea is still quite bearable. I thought this would be a super fun adventure for my husband and three boys but I had no idea how to execute it. With limited knowledge in the sport fishing arena, I went straight to the expert...Google. Not a lot came up on the internet to fill my criteria in Dubai so I broadened my search to a recommendation in Fujairah. 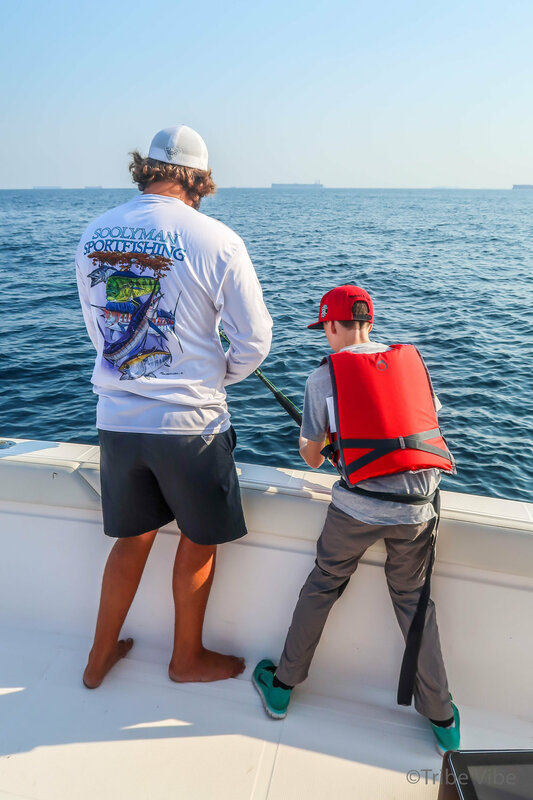 The most recommended company was Soolyman Sportfishing Charters. They offered two charters per day, boats carrying up to eight passengers, and they sold me on their water safety precautions. We would happily recommend this company to others. The cost for the charter is by boat, not by person. So regardless if the boat is empty or full, it will be the same flat fee. The boat we used could hold up to eight passengers so my husband and boys joined with another family of four to minimize the cost and add to the fun of spending the afternoon together. This brought the price per person down to 300 AED each. A decent price for 4-5 hours of fishing on the sea. When booking the tour, my kids looked on the website to see what kinds of fish could be caught. Glorious photos of colorful fish were displayed, but the boys thought that these were probably "one in a million catches." Boy were they wrong! Each of them got a chance to reel in a fighting fish of various sizes. They also quickly learned how tiring it is to get the fish in the boat! The guides were by the boys side from the moment a fish hit their line. Even, at times, physically holding the boys down so they didn't pop overboard trying to land their catch. They did a great job with the kids and made sure the entire day went smoothly. All the kids left with a catch ranging from big to small (small only in size, not in fight.) The large fish were a little freaky to look at - the kids thought they looked like prehistoric fish. Was there a problem with sea sickness? Nope, not at all. The water was very calm and everyone seemed to have their sea legs with them. A good tip to help with queasiness and possible boredom is to bring a cooler of snacks with you. When there wasn't much action with the fish, the kids were looking for food and loving the soft drinks that were provided by Soolyman. And don't worry, the boat is equipped with bathroom facilities, which seemed to fascinate my youngest. Look! This boat has a bathroom! Although the fishing was the obvious attraction, seeing the huge freight boats close up was something they didn't expect. Identifying where each ship was from, hearing how long it has been stationed near Fujairah, and waving at the crewmen way up on deck all sparked a lot of conversation. One of the many perks of living in the UAE is witnessing spectacular sunsets. Watching the sky turn a fiery orange and then transforming into night while being reflected on the glassy water, is a breathtaking image. When its time to leave Dubai, we will be thankful we took time for all these moments. The drive from Dubai to Fujairah took about one and a half hours. All the fish caught were eaten. Nothing was wasted. Life vests were our own although the boat had their own on board. We brought our own food but drinks were provided.